1. Grill or barbecue the chicken breast for 8 to 10 minutes or cooked. 3. Then cut into 1/2 inch cubes. 4. Mix the chicken with 3/4th of the barbecue sauce in a bowl and keep aside. 5. Mix the remaining barbecue sauce with the mayonnaise. 6. Place some of the lettuce leaves on serving plates. 7. Sprinkle the tomato, coriander leaves, jicama and corn over it. 8. Top with the barbecued chicken. 9. Serve with the dressing on the side. Note: Jicama is called shankalu in Bengal or kesaru or miskri kand in Bihar. 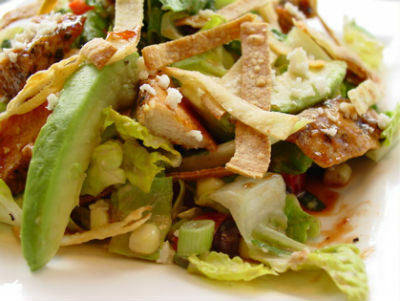 Feel free to comment or share your thoughts on this Barbecue Chicken Salad Recipe from Awesome Cuisine.